Send us your list, and we'll send your gifts! 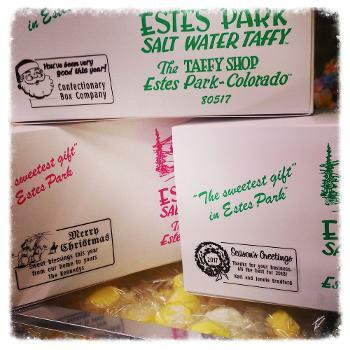 We offer a gift service that includes our fresh Estes Park Salt Water Taffy®, made by hand in the store as it has been since 1935, a Colorado and Estes Park Tradition we hope you will be proud to share with your valuable clients. Each gift may be accompanied by a greeting from your company that you can provide or we will prepare, as well as packaging and shipping originating from our store in Estes Park- so you don't have to handle any logistical details other than providing us with a contact list. A gift from The Taffy Shop isn't only great candy, there's a serving of tradition and charm in each box that will accompany a greeting from your business for any occasion. Use our recipient worksheet (Excel file, below), or submit your own list which includes order details listed below. Don't forget to include a contact phone number so we may confirm the order. You may also drop by the store to provide a handwritten list if you prefer. We'll acknowledge receipt of your list and contact you to confirm the order within a day or two. Taffy box size- Select Family, Large, Medium or Small box for each recipient. Flavor preferences- For volume orders, we offer the choice of either the classics (8 flavors), or all flavors available (classics + specials available on day of shipment). Picking specific special flavors is difficult because availability changes depending on what's needed in the store. In the case of holiday special flavors, time your shipment date to coincide with the holiday flavor cook dates and insure your gift boxes include these seasonal special flavors. You may exclude flavors from individual boxes in the event that they are available (ie: black licorice, pecans) but you may not add special flavors without discussing your request with us first. Personalized greeting- We'll include a handwritten note to your recipient if you like. We can send the same message to everyone on your list, or personalize it as you specify. We can enclose a card or printed material that you provide if you deliver it to our shop well ahead of the ship date. At the very least, include "To" and "From" to appear on the sticker affixed to the outside of the box. Customize taffy box- We can add your message or company logo to the taffy box itself to make a big impression that will be passed around with the sweet treat, and not become separated from the box like a card might be. Please take a look at Special Services, below. Generally we'll ship any size order to one address for $10. For orders above $200, we will charge the actual shipping cost to multiple addresses and include packaging labor/time at no additional cost. This saves you from having to manage the logistics of packaging, then dealing with the Post Office. We use USPS Priority Mail supplies and services for almost all of our shipments, and deliveries generally arrive on time in a clean, professional looking box. We say 'generally' because mail is delayed on some occasions beyond our control. Every package has tracking and you will be able to monitor your packages on the way to the destination. Also available: Undecorated white kraft paper bags and clear cellophane favor sized bags. See our Wedding page for images. These smaller options suitable to ship to one location for distribution of a smaller gift, but would be expensive to ship on their own. Call to discuss. Send us the material to include and we will insert in each gift box during packaging. Available, but subject to minimum order and longer lead times. Please contact us to discuss your idea. On occasion, packages are returned to us because of delivery issues. In the event that we made a mistake, we will send a new box of taffy at our shipping expense to the recipient. In the event that the package could not be delivered for any other reason, we will notify you of the return, and let you decide whether to reship the box at an additional shipping cost to an alternate address, hold the return for you to pick up in the store, or discard the returned taffy. We're happy to help with any order, and we'll walk through it with you. Our goal is to provide a simple process to send quality gifts from The Taffy Shop to your people. Many of our customers prefer to have a conversation with us rather than fill out forms and figure it out on their own. No problem! Call The Taffy Shop at 970-586-4548 and leave your name, number and good time to reach you, and the right person will call you to get the information efficiently. You may also email us at: TaffyShopOrders@gmail.com, or, use our contact page to send a message.